Baum Development acquired this 104,000 square foot property located at 2230 S. Michigan Avenue in 2003. The building had previously been vacant for more than 40 years. Originally constructed in 1922, the part two-story, part three-story, multi-tenant building is now occupied by four strong commercial tenants. Baum conducted a complete historic renovation in 2003-2004, which included gutting the building and extensive environmental remediation. was the first automotive showroom outside of Detroit. In the early 1900s, many well-known car manufacturers housed their vehicles in palace-like showrooms on Chicago's famous motor row. These showrooms created a unique form of commercial architecture which was awarded for its significance when it joined the National Register of Historic Places. With its history and unique architecture, Baum recognized an opportunity to combine several of its areas of expertise: historic preservation, adaptive reuse and its understanding of retailers' natural path of progress. The building is in the south loop district of downtown Chicago and is currently 100 percent occupied by Yellow Cab, Shore Bank Advisory Services, ClimaTemp F.E. Moran and the Marmon Grand banquet hall. 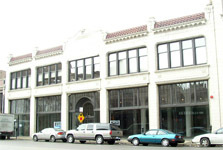 Baum received the 2004 Chicago Association of Realtor's Good Neighbor Award for contributions to Chicago Area Communities and the 2004 City of Chicago Landmark Award for Preservation Excellence - Façade Restoration/Adaptive Reuse.